Garin Flowers of Channel 10 ran this story this week with a married couple we have represented with Parent Plus loans. These loans had doubled before they came and consulted with us for repayment options. When the financial crisis hit in 2008, they were forced to go on forbearance for a number of years and the loan went from 47k to 84k. When Parent Plus loans are taken out, the parents’ income and number of income producing years before retirement are not even taken into account. 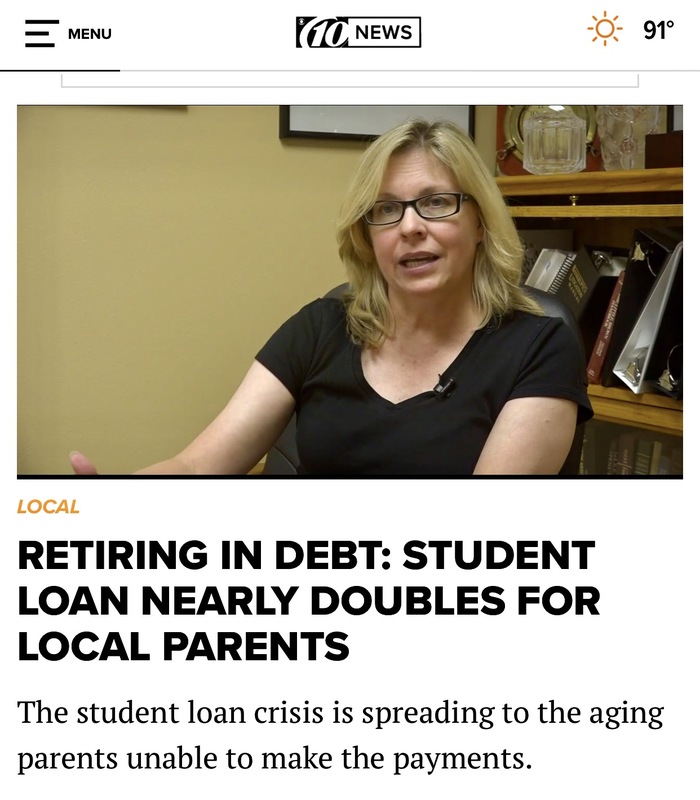 Unlike a student with a lifetime of earnings ahead of him or her, parents may have only ten years to retirement – even if there wasn’t a financial crisis causing massive job losses during that time period. Older Americans have nearly 70 billion of Parent Plus loans as of 2015 according to a January CFPB Report: Snapshot of Older Consumers and Student Loan Debt. The CFPB receives a large number of servicing and debt collection complaints by older Americans. Nearly 40% of federal student loan borrowers over the age of 65 are in default according to the CFPB Report. Default brings a whole set of nasty outcomes including wage garnishment, social security offsets and tax refund interception, as well as negative credit ratings. Often a student loan attorney can help to prevent a default or cure a default that has already occurred. We have found there are solutions, and often the servicers do not discuss all of the available options with borrowers. They tend to emphasize forbearance – which is a temporary bandaid at best. The loan balance just continues to increase – and capitalized interest adds up quickly. Don’t go into default by missing payments. This can add an additional 25 percent to the loan balance. Also, try to avoid forbearance, which compounds interest. Know your options: like income-based repayment plans and loan consolidation. Be careful with private companies offering to refinance because they don’t come with the same federal protections (such as income based plans with debt forgiveness or disability discharges). Lastly, consider a loan attorney. The last item is important. A student loan attorney is your advocate. They understand the otherwise non-transparent student loan system. A student loan servicer is a debt collector, period. They represent the other side. For anyone who doubts this, read this article: Student Loan Giant Navient on Suit: “no expectation” it will act “in the interest of the consumer”. In perhaps the worst marketing decision next to United’s violent removal of its overbooked passenger this Spring, Navient’s response to a CFPB lawsuit is that it isn’t being paid enough to explain to borrowers the various income based/debt forgiveness plans. Navient itself argues that its job is to collect money for the creditor. There are several income based plans (ISR, IBR, Paye, RePaye, ICR and IBR for New Borrowers) and not all of them have debt forgiveness. The terms of each vary. IBR is not a one size fit all proposition and borrowers should fully understand the differences between the plans to make their own decision as to what is best for their family. If they don’t know, it’s best to retain a student loan attorney. The small fee you will pay for getting on the right plan will likely save you tens of thousands over the life of the loan. Trusting the servicer to choose for you is giving control to “the debt collector”. For more information, please contact us at ChristieArkovich.com. And be sure to check out our Student Loan Survival Center on our website.